Independence Day 2009 marked the grand opening of this new performance venue in Red Wing’s Central Park. 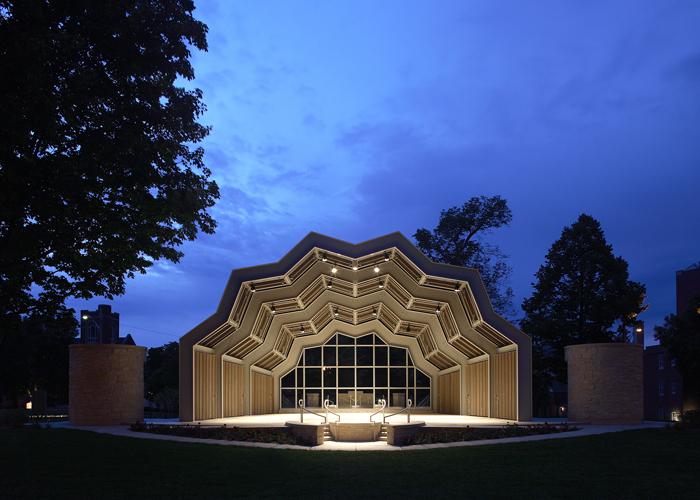 To ensure the $150,000 structural steel band shell would be ready in time, MBJ and other team members worked on a fast-track schedule using Revit Structure to design the project in a shared virtual environment. Revit allowed team members to more easily envision member sizes, connections, and possible conflicts. Because the team was able to virtually review options, they could more easily adjust their design to balance strength, serviceability, architectural vision, and ease of construction. The finished Revit model was later used to create a Tekla construction model to produce final steel shop drawings, which further streamlined the process. 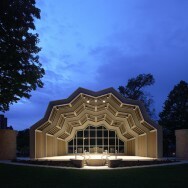 A demand for rich acoustics drove the band shell’s dramatic form. Given the structure’s unique geometrics, designing for constructability—while supporting the architectural vision,—was an important part of the project. Traditional lateral load resisting systems could not be used because of the exposed structure and unique roof configuration. Geometry issues typically add complexity and cost to a project, so MBJ worked to simplify connections and ease constructability, helping to minimize field erection errors, while providing a repetitive construction method. The team designed a unique steel moment frame structure to support an eccentrically loaded bi-folding radial horizontal Vierendeel truss. The main lateral load resisting system consists of four “bents” that are constructed with peaks and valleys and align with a radial elliptical grid system. Pivoting doors allow the space to be acoustically “tuned” and add a sense of transparency, providing views beyond the park.